The mixed nut meal on top and the naughty sultanas all on the bottom. I have already made this easy Chocolate Sultana Cake recipe before in my wheat days. It was incredibly delicious then and is still just as tasty without flour. This time around I used a cup of mixed nuts. I ground them up into a nut meal just for some fun to see how it would come out. 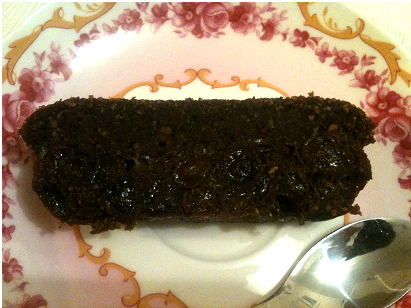 Unfortunately all the sultanas sank to the bottom as you can see in the photo above but it is still a delicious cake. I thought maybe the nut meal would hold the sultanas better and they would be evenly distributed but I was wrong. Not a bad thing. It has all been gobbled up already. I also reduced a lot of the sugar and have started using xylitol. I used it before and unfortunately as it does to most people worked as a very good laxative to put it in mild terms. 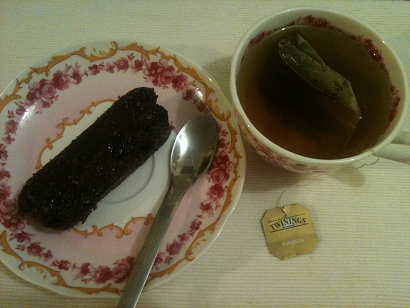 I find honey makes a dense cake and was trying to make a "normal cake" consistency but the sultanas put a stop to that. I think next time I will use half the amount of sultanas and maybe 2 tablespoons of honey instead of the sugar and xylitol. This chocolate sultana cake recipe is very easy to make and a favourite so will keep making it until I get it perfect. Stay tuned. In the meantime make it and enjoy! In a food processor grind up mixed nuts into a nut meal. You can use a single nut like almonds or cashew but I had mixed nuts and thought it would be fun to try something different. Add milk and sultanas and mix well. Combine almond meal and cocoa together then mix into wet ingredients. Pour mixture into lined loaf tin. Bake in preheated oven at 180°C for 40 minutes. Make sure it is in the middle not the top tray or it will burn and stay raw. Then place foil on top to stop any further browning and bake for a further 15-20 minutes or until a skewer comes out clean. This is such an easy coconut chicken recipe. I had some coconut milk in the fridge and was wondering what to make with it. I had some chicken so decided to poach it in the milk. This is now one of my favourite recipes. The chicken is incredibly delicious and so flavoursome and the spiciness of the zucchini chips with the fresh flavour of the mint is divine. Cut chicken into large pieces. Bring the coconut milk to the boil in a saucepan then reduce and simmer. Place chicken in milk and poach for 10 minutes or until cooked. Drain. While the chicken is poaching slice up the zucchini and mix with chili. Cook in a small fry pan for a few minutes until slightly browned. 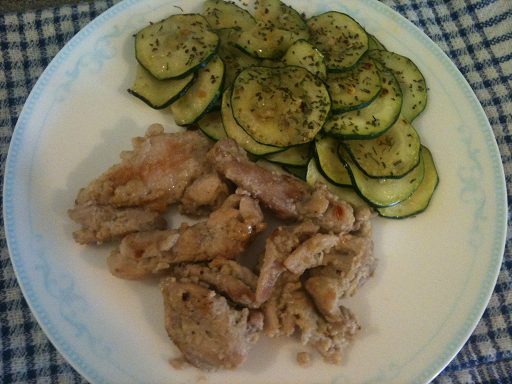 Place the chicken on a plate then when ready place the zucchini chips on the plate and top with herbs and season with salt and pepper.